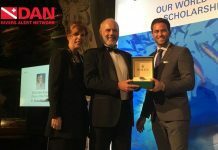 The work of scuba diving rehabilitation charity Deptherapy and Deptherapy Education has been recognised with the presentation of a top military Award. The outstanding work of scuba diving rehabilitation charity Deptherapy and Deptherapy Education has been recognised with the presentation of a top military Award. Richard Cullen, Founder and Chairman of Deptherapy & Deptherapy Education, received the Soldiering On Award on behalf of the charity at a black tie gala event at the Westminster Park Plaza in London on Friday 20th April 2018. Guests at the Awards ceremony included Deptherapy Programme Members and Trustees, who were inspired by stories of those veterans who have overcome remarkable adversity. Classical singer Carly Paoli and the London Military Band provided the evening’s entertainment, whilst the hosts for the event were Vicki Michelle MBE and Jeremy Vine. On receiving the Award, Richard Cullen said: “Winning the Healthcare and Rehabilitation Category at the prestigious Soldiering on Awards in London was a stunning achievement given the very stiff competition we faced in the group. “Huge thanks to the team at Soldiering On, those who nominated us, the Judges and Redwood Technologies Group for sponsoring the Award. However, the highest praise goes to the Trustees, Patrons, Ambassadors and Volunteers who work tirelessly and for free to help our Armed Forces’ veterans. Find out more and support the work of Deptherapy & Deptherapy Education at www.deptherapy.co.uk. Photo caption: Jeremy Vine, Richard Cullen, Vicki Michelle, Martin Taylor – Co-founder and CMO of the Redwood Technologies Group – and Major General Martin Bricknell OStJ PhD DM – Surgeon General of the UK Armed Forces. Photo credit: Schmooly/Soldiering On Awards.